A very cheap and easy solution for your Home Automation over the Internet and (W)LAN with a WebSocket capable Web Browser (HTML5). A Mesh Nodes ad-hoc network with a lot off IoT modules. Each Node may, independently of the other Nodes, automatically run commands that are stored in a private Node SPIFF-simpleDatabase. We use only a Web Browser to create and modify the database command records. Each Node test once per minute the record(s) if a automatic action is needed. With a Web Browser we can overrule, pause or stop the automatic functions. Use the simpleHomeSwitch template to create a new Node (open as a Arduino example). simplePublish (replacement for the old NHS (Not)AtHome module). 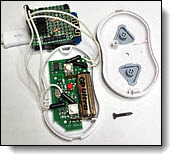 Sonoff-button Publish (Not)AtHome and combined with front/back night lighting (mode: 8, Night on sunSet/sunRise times). kitchen boiler switch with multi temperatures on time X,Y,Z. A Node can ask another Node for values such as time, temperature, light intensity or whatever is available. You can add your own functions and or commands. 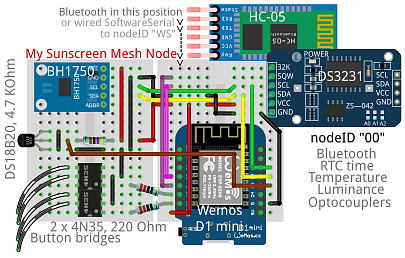 A ESP8266 Wi-Fi Server is limited to maximal four simultaneous connections, and sometimes old connections are still registered. One server with maximal two IoT Slaves and a Web Browser Slave is possible. No problem there is a painlessMesh library from BlackEdder ;-) it is perfect to solve the connection problem. But... a ESP8266 Wi-Fi Mesh Network, or actually more an wireless ad-hoc network, can't connect to a Local Wi-Fi Home Network. So, first log in on a Node with WebSocket and then, only local, communicate through a Web Browser. That is still tricky, limited, and not my thing. (IoT WS) WebSocket Server <-> Web Browser WebSocket Client (browsers WB). + SoftwareSerial (115200 baud) HC-05 Serial Bluetooth Master. - WLAN HTML5 Browser Client(s). - Internet HTML5 Browser Client(s). The WebSocket Server must have a static IP. 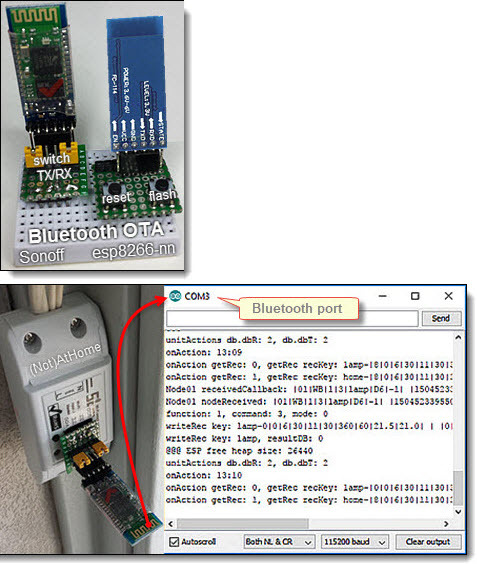 (IoT 00) SoftwareSerial (115200 baud) HC-05 Serial Bluetooth Slave. + Mesh Wi-Fi ad-hoc Network Node. 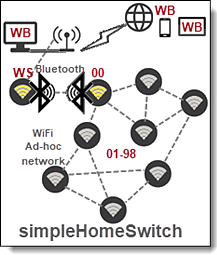 (IoT 01-98) Mesh Wi-Fi ad-hoc Network Nodes . It's looks complicated but is yet simple, very cheap and works fine. All he Nodes, included WS and 00, can be equipped with your own functions and hardware. Each Node may, independently of the other Nodes, automatically run commands that are stored in a private Node SPIFF-simpleDatabase. We use a Web Browser to create and modify this database records. 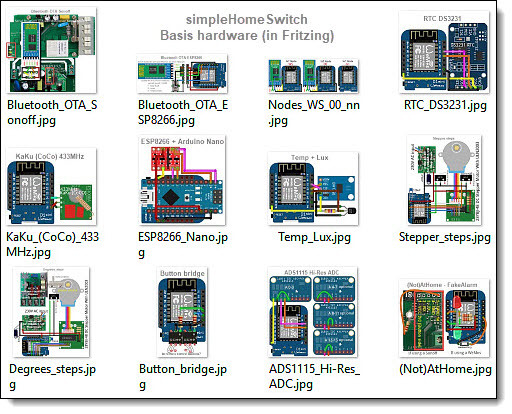 You can combine two, or more, Fritzing modules to one Node. My Sunscreen is controlled with this Mesh Node on temperature and light intensity. (example DOWN: >=21.5*C && >=360 LUX, UP: <21*C || <120 LUX. With anti Yo-Yo delay and bath weather UP). Other Nodes may ask for the time, Temp and Lux. It communicate over, Bluetooth or Wired, SoftwareSerial with the WebSocket Server Node WS. And, of course, with all the other Mesh Nodes in this wireless ad-hoc network. Also useful to operate a Node with a (Web Browser)App. Use function 3, command 3 in a time loop, with NodeID and record Key, and get the required values to update the Chart. *  A unit is a "function" on a Mesh Node. A Node can have more than one function. 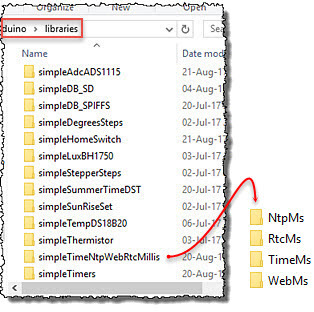 *  A unit (setup function 1 commands) is saved in the Mesh Node database. *  Automatic unit actions setup in function 2. Other, not unit, commands in function 3. *                                       to get the right "code"! *                     ask NodeWS or a Node with a RTC or all "99"